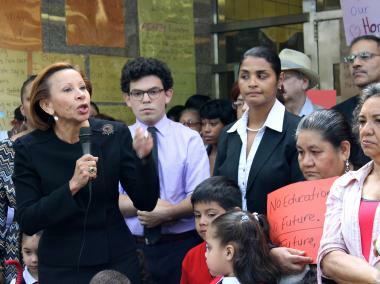 Rep. Nydia Velazquez (at left) is vying for re-election in the 7th Congressional District. LOWER EAST SIDE — Rep. Nydia Velazquez's office is warning Chinese-speaking voters not to be confused if her name is misspelled on ballot papers for Tuesday’s primary elections. Officials were alarmed to discover this week that instead of a four-character Chinese translation that is meant to phonetically spell the incumbent's first and last name, the eight-character translation that currently appears on the Board of Elections' District 7 ballot is the equivalent of a name that sounds nothing like Nydia Velazquez, according to her campaign spokesman George Arzt. Now Velazquez's team is manning the polls with staffers and trying to get the word out to Chinese-speaking voters who might be confused at the voting machines. "We are always concerned that voters will be confused," Arzt said, adding that he is worried the error could cost Velazquez valuable votes. Arzt said a member of Velazquez's office noticed the error a few days ago, and since then her staffers have been trying to get the word out to voters through Chinese newspapers and at the polls. "We are asking people to vote for the wrong spelling," Arzt added. He was unable to confirm what the misspelling actually translated to. Velazquez, who has been in office for more than 20 years, is vying for re-election in the 7th Congressional District and is facing stiff competition from term-limited City Councilman Erik Martin Dilan. The district includes Chinatown and Sunset Park and has a large Asian-American population. Velazquez was given adequate time to ensure her name was spelled correctly on the ballot, according to the city's board of elections. Six weeks ago, all candidates received notification of how their name would be translated on the ballot paper, according to the board's director of communications, Valerie Vazquez. After that notification, candidates had seven days to inform the board of any errors. "If there is no response, then we proceed in the translation provided by our staff," Vazquez said. Vazquez said there was no communication from Velazquez's office that anything was wrong.